Recent study sheds new light on the environmental conditions necessary for sand wedge formation. Sand wedges are cold-climate features formed by the repeated infilling of ground thermal contraction cracks by sand. They are commonly considered akin to ice wedges, which form by the refreezing of surface melt waters into cracks within permafrost. Both create conspicuous polygonal ground patterns when viewed from above, and commonly form v-shaped downward-tapering wedges beneath a central trough. Relict, Quaternary-age sand wedges are common in eolian sands of western Europe, eastern United States and western Arctic Canada. But until now, the only modern observations of active sand wedges were from Antarctica, the coldest contemporary place on our planet. The limited observations of modern sand wedges have severely biased the interpretation of the range of environmental conditions in which these ground features can form. To understand the conditions in which sand wedges can grow, Wolfe et al. monitored contemporary sand wedges in an area of discontinuous permafrost. Contrary to expectations, they discovered that sand wedges were active within seasonally frozen ground whereas no wedges were found in the nearby permafrost. Winter ground temperatures reaching -25 °C in the near surface of the seasonally frozen ground frequently exceeded the cracking threshold for ice and sand wedges whereas ground temperatures in the nearby permafrost soils in peatlands remained too warm for seasonal ground cracking. Two distinctly different sand wedges: A) sand wedge with voids infilled by sediment from a bare sand surface, and B) sand wedge with a vegetation cover causing voids to be infilled by host sediments, causing downturning. The growth of sand wedges in seasonally frozen ground was facilitated by thin snow cover and high thermal conductivity, promoting rapid ground freezing and high rates of cooling and resulting in thermal contraction cracking to depths of 1.2 m within soils that thawed each year. 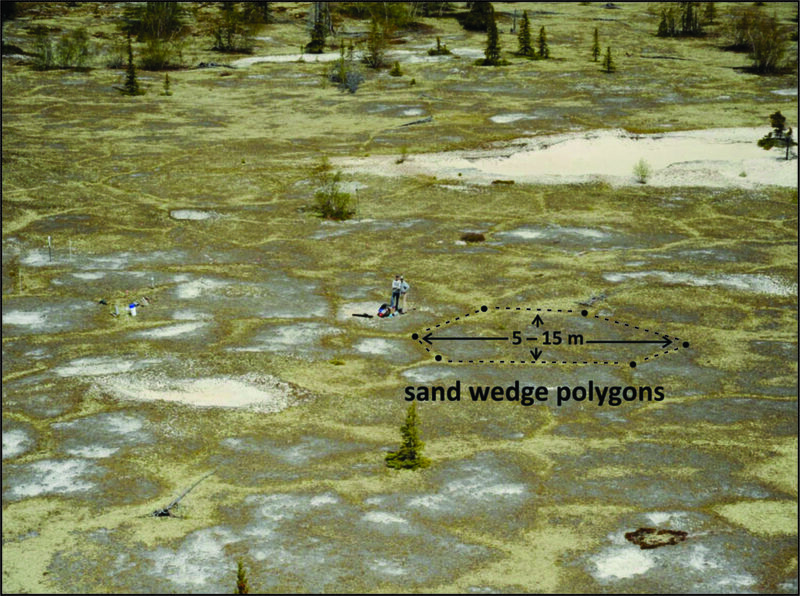 The study sheds new light on the environmental conditions suitable for sand wedges, indicating that permafrost conditions are not always necessary for their formation. It also explains the occasionally observed downturning of adjacent strata in host sediments, which can be explained by the thawing of ice wedges but is difficult to explain for sand wedges. The downturning was found to be caused by a surface cover that prevented the infilling of ground cracks by surface sand. This created conditions whereby the host sediments infilled the void, leading to downturning of the strata at these locations. Citation: Wolfe, S.A., Morse, P.D., Neudorf, C.M., Kokelj, S.V., Lian, O.B. and O’Neill, H.B., 2018. Contemporary sand wedge development in seasonally frozen ground and paleoenvironmental implications. Geomorphology, 308, pp.215-229.